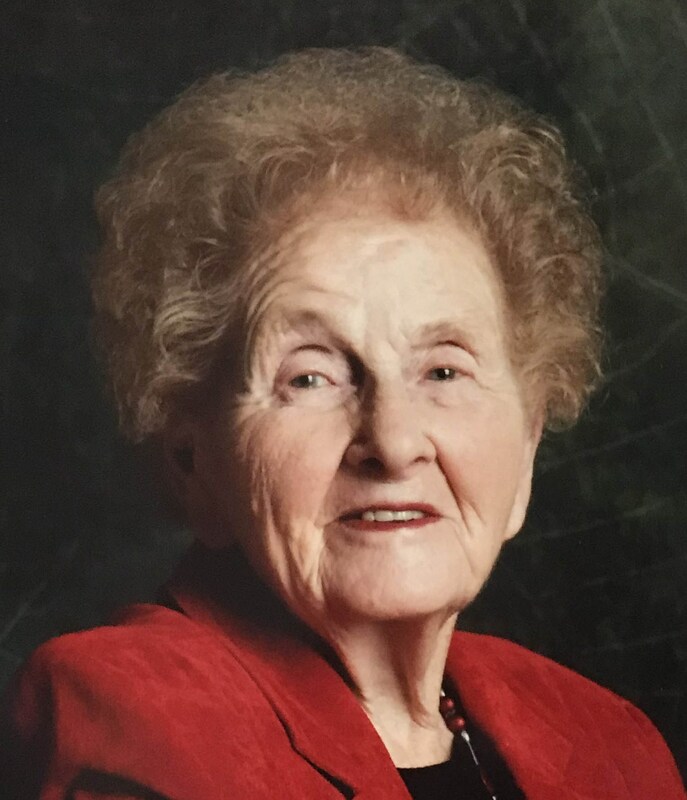 BURLEY – Blanche Hannah Koyle Simmons, 93, passed away on Monday, November 26, 2018, at her home surrounded by her loving family. Blanche was born March 2, 1925, to Silas Archibald and Johanna Johnson Koyle, in Hazel, which is known today as Willow Creek; 10 miles south along the 150 East Road of Burley. She was the sixth of eight children raised on the family’s farm at the base of Mount Harrison. There, she learned how to work hard. She grew up during the Depression and was poor but was never hungry as the family raised their own vegetables and animals which they harvested each fall and preserved for their winter food. She lost her father, Silas, in a gravel pit cave-in accident when she was only nine years old. Her mother continued to farm and raised the family in Willow Creek. She attended a one-room school in Willow Creek from first through eighth grades, then she attended ninth through 12th grades at Burley High School and graduated in 1943. She attended BYU where she earned a Bachelor of Science degree, with a major in Business and Secondary Education. She also earned a certificate of Elementary Education later at the University of Utah. Blanche served a two-year mission in Holland for the Church of Jesus Christ of Latter-day Saints in November 1948 - 1950. Upon returning from her mission she met and married the love of her life, Uriel “Dean” Simmons, which marriage was solemnized in the Idaho Falls Temple on July 31, 1951. Together they shared 67 ½ years of marriage. Due to the fact that they could not have children of their own, they adopted five children and raised them on a farm south of Burley where Dean, her husband, was born and raised. She taught her children how to work, and work hard! She worked alongside them thinning and hoeing sugar beets and pulling weeds from beans; also planting and weeding the garden and canning those vegetables so that the family had food for the winter. Blanche loved Family History and worked many years to find and record who her ancestors were so that her family would know their ancestry. She spent many long hours composing family history and life stories of her ancestors to give to her family members at family reunions. She also shared her knowledge with others in the community so they could research and find their own ancestors. She spent many years working at the Family History Center in Burley and, for 25 years, she and Dean served a mission at the Family History Center as Assistant Directors for the Church of Jesus Christ of Latter-day Saints. She also taught classes there until the last couple of months of her life. She was an example of service to all who knew her. Blanche would send out birthday cards to many ladies she knew from the Pella 1st Ward, and others whom she remained in contact with after the ward boundaries had changed. She would carefully write a special, well thought-out, personalized message to each and everyone of them. She loved those she served and always wanted them to feel loved and appreciated. She loved her family and extended family and always looked forward to her family reunions, whether it was the John Hyrum or the Silas Koyle reunions. She always loved her reunion with her personal family and looked forward to that event every July in Island Park. Blanche loved to travel and took a vacation somewhere in the United States every year. She was also able to travel to Europe and, to Iceland several times, with her sisters – this was something she really enjoyed. Blanche was an active member of the Church of Jesus Christ of Latter-day Saints were she served in many callings and put her whole heart and soul into whatever capacity she was called to serve. She is survived by her husband, Dean; and three children, Kenneth Dean of Brigham City, Utah, Robert Dee of Roy, Utah, and Darla Sue Simmons of Burley, Idaho; one sister, Bliss Emily Koyle Anderson of Murray, Utah; and one brother, Dean Halldor Koyle of Burley, Idaho; eight grandchildren; and eight great-grandchildren. She was preceded in death by her parents; two of her sons, Steven Thomas, and Gary Lee Simmons; one grandson, Tyler Dean Simmons; three brothers, Eldon Silas Koyle, Rodney John Koyle and Wells Freeman Koyle; and two sisters, Doris Thorun Koyle, and Mildred Dorothea Koyle Pocock. Blanche’s family would like to give special thanks Dr. Kevin Owens and Minidoka Memorial Hospital for the care they gave to our mother the past two months; and to Hospice Visions and Glenna Bennett for their help with Mom the last part of her life. The funeral will be held at 11 a.m. Friday, Dec. 7, at The Church of Jesus Christ of Latter-day Saints – Pella 1st Ward, located at 152 W. 400 S. Burley, Idaho. Burial will follow at the Pleasant View Cemetery in Burley. Friends may call from 6 until 8 p.m. Thursday Dec. 6, at Rasmussen-Wilson Funeral Home, 1350 E. 16th St., in Burley, and from 10 until 10:45 a.m. preceding the funeral service at the church. In lieu of flowers, donations may be made to the Primary Children’s Hospital or to The Church of Jesus Christ of Latter-day Saints Mission fund.